﻿ How to Make iPhone Text Tones for iPhone 5/4S/4/3GS from MP3,WAV,M4A,etc. Home » ios » How to Create, Custom and Make iPhone Text Tones for iOS 5/iOS 6 iPhone 5S/5C/5/4S/4/3GS? How to Create, Custom and Make iPhone Text Tones for iOS 5/iOS 6 iPhone 5S/5C/5/4S/4/3GS? Create iPhone Text Tones with the Professional iPhone Text Tone Maker from MP3, WAV, YouTube and more. One of the new features of iOS 5 is the ability to purchase text tones from the iTunes Store. Any iOS 5 based iPhone (including iPhone 4S, iPhone 4, iPhone 3GS) enables to select ringtones as iPhone text message tones. So does the iOS 6 based iPhone like iPhone 5S, iPhone 5C, iPhone 5, iPhone 4S, iPhone 4, and iPhone 3GS. Have you ever thought to make iPhone text tones for free instead of purchasing from the iTunes Store? Have you ever thought to customize iPhone text tones from songs or movies instead of iPhone ringtones? The following article aims to provide the applied solution for the above questions. It will introduce a powerful iPhone text tone maker and a step by step guide on how to make free iPhone text tones from various audio and video. Then iPhone fans can easily distinguish their important texts from others with these default custom text tones without looking at their screen. 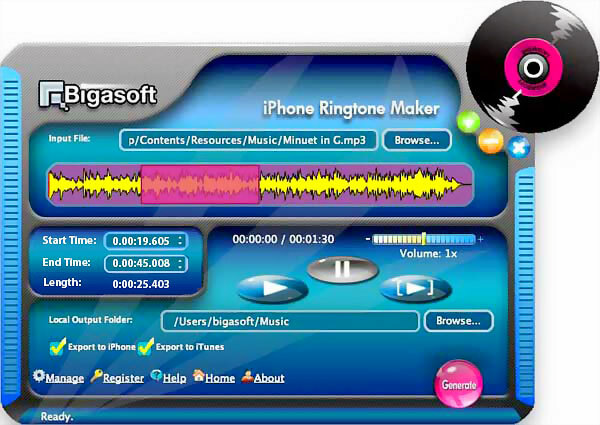 Besides act as a professional iPhone Ringtone Creator, Bigasoft iPhone Ringtone Maker is also an ideal text tone maker for iPhone. It can easily create iPhone text tones from various music, music video, and game play as well as enable to make text message or alerts with length 2-5 seconds or longer than 5 seconds. With this powerful iPhone Text Tone Maker, we can make iPhone text tones from almost all kinds of audio including MP3, M4A, AAC, WAV, WMA, AIFF, CAF, APE, M4B, AU and more, make iPhone text message tones from all popular videos including MP4, AVI, MOV, 3GP, FLV, MKV, MPG, WMV, VOB, MVI, MTS, BIK, RMVB, ASF, DV, WebM and etc. Make text message or alerts with length 2-5 seconds or longer than 5 seconds. Make text tones for iPhones from songs like MP3 to iPhone text tone, WMA to iPhone text tone, M4A to iPhone text tone and more. Make iPhone text tones from movies like MP4 to iPhone text message tone, AVI to iPhone text tone and etc. This guide applies to iOS 5 based iPhone 4S, iPhone 4 and iPhone 3GS. This guide also applies to iOS 6 based iPhone 5S, iPhone 5C, iPhone 5, iPhone 4S, iPhone 4, and iPhone 3GS. 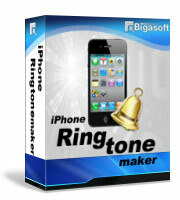 Free download the professional iPhone Text Tone Maker - Bigasoft iPhone Ringtone Maker (Windows Version, Mac Version), install and run it, the following interface will pop up. Click "Browse..." button to add your favorite audio or video which you want as text tones for iPhone. Set favorite audio clip as text message tone by drag and release on slider. Or by type in the start time in the "Start Time" text box and the end time in the "End Time" text box. Tips: You can either set text alerts with length 2-5 seconds or longer than 5 seconds; you can even set your text tone as long as 30 seconds, but the tone will not stop and will play the full 30 seconds until you open your Messages app to reply to the message. It is not allowed to set text tone longer than 30 seconds. Firstly, connect your iPhone to computer, then check before "Export to iPhone", and finally click "Generate" button to create iPhone text tone, the powerful iPhone Text Tone Maker will automatically transfer the created text tone to iPhone. Open your iPhone, tap the contact in your Contacts app and then click the Edit button at the upper right corner of the screen. Scroll down in the contact detail until you see the "text tone" field - it's right underneath the ringtone field. Tap the text tone field to bring up the scrolling list of available sounds. Tap the sound you want for this contact, and click Save. That's it.